(Nanowerk Spotlight) The newly created U.S. Nanotechnology Protection Agency (NPA) announced today, April 1, 2008, that, effective immediately, all laboratories and production facilities for molecular assemblers (commonly called nanobots) need a special license and have to follow strict guidelines in all research and production facilities that deal with nanoassemblers. At the same time, the NPA declared gray goo a hazardous substance. While the NPA regulations will have an immediate economic impact on many nanotechnology companies, most have been preparing for this dreaded day. However, public and media reactions seem to indicate that the public and many organizations were taken completely by surprise. The Project for Exposing Nanotechnologies (PEN) issued a statement in which it said that this new regulation has been overdue. Coincidentally, PEN already has scheduled a press conference and webinar to introduce the release of its new report "Do nanobots dream? – The philosophical and ethical issues surrounding molecular assemblers." Sandwich lunch will be served. A spokesperson for Friends of the Earth Australia criticized the NPA’s decision as "too little, too late." She said that FoE has talked about nanobots in sunscreens for ages and only now does the world wake up to this problem. "Every summer beachgoers in Australia go bonkers over the little holes that sunscreen nanobots drill into their skin. While the holes are only nanometers-deep and generally more a nuisance than a health risk, some people, especially those with thin skin, need to be hospitalized and have the nanobots surgically removed by specially trained nano-dermatologists." Taking a more positive spin on this issue, Invest Australia, the Australian inward investment agency, points out that Nanobot-Dermatology is now taught at 80% of Australian universities and that the first start-ups have begun commercializing this new field. Australia is now the world leader in procedures and instruments, the agency said. "Where is the warning sign for green goo?" asked the ETC. Nanofood applications messing up our spinach are as dangerous as the gray stuff. "There are many canaries emerging in the nanotechnology coal mine," the organization’s executive director said in a statement. "Nanobots are perhaps among those making the most noise and it is absolutely essential that everyone sits up and takes notice." 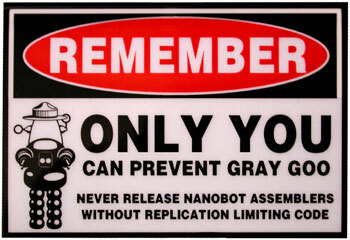 Elsewhere, CRN has announced a joint event with Kurzweil to discuss the role of nanobots in the coming singularity and to debate what shade of gray the color of nanogoo most likely will be. While the rest of the world is only slowly waking up to the news, and academic circles take a measured and scientific approach, the public and media reactions in the U.S. have been swift and strong on both sides of the debate. A spokesperson for the National Association of Molecular Assembler Systems (MOLEASS) said that the new regulation would increase the production cost for nanobots. "This is the straw that breaks the camel’s back" she said. "It is absolutely imperative that the U.S. immediately increases the import duties for all molecularly assembled products from China in order for our American companies to stay competitive and to save tens of thousands of American jobs." She accused nanoassembly firms in Asia to unfairly undercut American manufacturers by skirting safety regulations. "Having smaller fingers, they already have an unfair advantage in the assembly process" she points out. "We are all for a safe handling environment for these exciting products" she emphasizes, "but American manufacturers can’t be singled out to have the strictest regulations on the planet imposed on them. What we need is an international approach that is fair to everyone. We need to thoroughly study the issues before we jump to conclusions." As a demonstration how serious they take their responsibilities, MOLEASS introduced a 10-year grant program for researchers to explore the environmental impact of molecular assembly technology. "We need to wait for all cards to be on the table before we can say anything definitive. Panicky reactions like the one we saw from NPA today are not helpful at all. With our grant program, we'll know more by 2018." America Rules, the conservative Washington-based think tank, agrees: "This is just another example of bureaucrats in Washington creating unnecessary red tape that makes American-made nanoproducts uncompetitive on the world market. This has short-sighted liberal anti free market policy written all over it. Our inventors and creative minds are now forced to compete with one hand tied behind their back." A senior senator in Washington even went so far as to call the debate about nanobots "the biggest hoax ever perpetrated on the American people." Much of the debate over gray goo is predicated on fear, rather than science, he said. "Environmental extremists and their elitist organizations have succeeded in turning one of the biggest industrial achievements of our great country into a perversion of science." In a meeting with religious groups at the White House, the President said that Gray Goo is just a theory and should be studied alongside competing theories. The President said that he has learned a lot about nanotechnology from his discussions with Michael Crichton, author of Prey. "What concerns me most" he said, "is that some scientists claim that nanobots are a form of life. We should take these claims seriously. Make no mistake, this administration will do whatever it takes to protect live, no matter how small or gray it is." He then signed an executive order that imposes a moratorium on nanobot research in the United States. Effective immediately, federal research grants will only be available for research on the existing 14 families of nanobots, but not the creation of new ones. At the same meeting, religious leaders criticized the NPA's effort to regulate nanobot replication rates. They were especially critical of a plastic thin film – so-called nanocondoms – that seals molecular assembly platforms to prevent nanobots from escaping the staging area but also protects them from becoming infected with a virus. The televangelists, who think that nanotechnology is morally unacceptable anyway, made it clear that a responsible society should pledge abstinence to any assembler activity and not engage in frivolous molecular assembly. Some forward-looking Intelligent Design experts have begun to explore scientific similarities between armageddon and a gray goo scenario and insist that their theory be included in high school curricula across the country. In a move that surprised observers with its swiftness, the Department of Homeland Security (DHS) announced today that it has begun upgrading its colored threat warning system to include the color gray. "If these nanobots fall into the hands of islamic fundamentalists and other evildoers, the risks to our homeland are enormous" said a DHS press officer. "As soon as we see any signs of gray goo, we’ll go to Threat Level Gray and a set of carefully designed emergency procedures will take effect." Elsewhere in Washington, a bipartisan group of Members of Congress introduced a new bill that seeks $180 million in emergency funding to patch holes in the fence along the Mexican border in order to prevent illegally built nanobots from getting through. "The risks to our country are unacceptable" says Congressman S. Gonzales from New Mexico in an appearance on TV morning talkshows. "If these undocumented nanobots succeed coming into our country the damage to our economy would be incalculable." Already, the Minuteman, a vigilante group, have issued their members handheld scanners that allows them to detect small concentrations of gray goo alongside the border. "As soon as we see the first signs of foreign looking nanobots, or if we find their programming language is not English, we’ll squash them like, well, little bugs" said the group's argus-eyed Chief Vigilant Officer. CNN is planning a "Anderson Cooper 360" special where Anderson will host a 24-hour ‘Nanothon’ from the factory floor of one of the affected nanobot companies to show the impact on workers’ families after the NPA regulation takes effect. Designed as a joint event with YouTube, viewers are invited to send in clips with their personal experiences, good or bad, with nanobots and any actual footage of gray goo. Representatives for two market research firms, Lachs Research and Terrifica, also appeared well-prepared to further exploit their deep understanding of nanotechnology. The NPA announcement coincided with both firms releasing their latest market research reports (both priced at a reasonable $4999.95) forecasting the market for nanobots. "Our latest report is the definitive guide to the use of molecular assemblers for, well, everything" says one senior consultant. "We examined over 2000 different companies, analyzing where they are in their product pipeline, the available market, size and weight of the individual nanobots, all available operating systems, and the mind-boggling value that these tiny little buggers will add to the world economy. We conservatively estimate the market for nanobot-enabled technologies to be $4.5 trillion by 2014 but this value could increase significantly in a very short time if the self-replication rate of molecular assemblers becomes exponential." William R. Inge, the British vicar known as the Gloomy Dean, once said that "anxiety is interest paid on trouble before it is due." A half-century after his death, Britain still leads the way in anticipating bad news. Leading the charge, the Prince of Wales, upon being briefed on the issue, immediately condemned the "irresponsible attitude of molecular scientists...who ...play dice with God’s creation." He called on corporate leaders and scientists worldwide to take a step back and think about the consequences of their actions. His Royal Highness, on route to a fox hunt, was very surprised to learn from a reporter that the reason his new riding coat was water repellant and blood stain resistant was due to novel textile fibers coated with nanoparticles. In Europe, the EU Commission is preparing regulation similar to the NPA’s. One insider told Nanowerk that the new law, which needs to be translated into all 20 official EU languages, is being held up because the French don’t have a word for gray goo. "We always associated this term with British food" said the French delegate. "Mon dieu, if this is what nanofood tastes like we don’t want to have anything to do with it." This all of course is great news for a group of nanotechnology start-up companies that stand to reap fortunes from nanobot detection and gray goo clean-up technologies. Venture capitalists and all the big names in the investment newsletter industry are exited as never before about the potential. "This really is the breakthrough for the gray-green nanotechnology industry" said Charles 'Tiny' Goldmuenz, one of the leading nanotechnology investment experts and editor of the popular Goldmuenz report. "I am especially exited about the upcoming IPO of Botzap, Inc., a developer of disposable handheld gray goo detection scanners to be soon sold under the trade name Goo-Scan™ at all major department stores for only $9.95. The company holds 65 patents, has an incredibly strong management team and has already gone through $42 million venture capital funding. The company clearly is poised to be the frontrunner in this field and we hope that some day it even will be profitable." Brandnew update: A recent research report from UC San Francisco sensationally claims the discovery of pink goo. This exciting new substance achieves its zero-friction properties through large numbers of slip-sliding nanobots embedded in petroleum jelly. This nanocomposite material glows a lovely pink under bathroom lights, hence its nickname. "It’s far too early to say if there are any risks for the environment from this substance" one of the UCSF researchers explains to Nanowerk. "We are still performing field tests but it appears that the nanobots get really slippery inside the jelly." First results also show that pink goo bots tend to feed on gray goo bots, so the end of the world might actually look quite pretty when seen from outer space, especially just before sunset.